Type I interferons are pleiotropic cytokines with antiviral, antitumor and immunoregulatory functions. An aspect of their complex biology is the paradox that, depending on context, type I interferons can be anti-inflammatory and tissue protective or can be proinflammatory and promote autoimmunity. Along these lines, the activation of type I interferon pathways is effective in suppressing disease activity in patients with multiple sclerosis and in animal models of arthritis and colitis, while there is an expectation that blockade of the same pathways will be beneficial in the treatment of patients with systemic lupus erythematosus. In 1957 a soluble product of influenza virus-infected chick embryo cells that conferred resistance to viral infection was first described . During the following years a family of cytokines capable of interfering (inhibiting) with viral replication was discovered in jawed vertebrates, and its members were defined as interferons [2, 3]. The family of interferons comprises type I interferons, the type II interferon named IFNγ and the most recently discovered type III interferons, termed IFNλ (IFNλ1 or IL-29, IFNλ2 or IL-28A and IFNλ3 or IL-28B) [4, 5]. Type I interferons are a large group of structurally similar cytokines, in humans including more than 13 different members of IFNα as well as IFNβ, IFNε, IFNκ and IFNω . The genes encoding type I interferons are clustered in one locus on the same chromosome (chromosome 9 in humans and chromosome 4 in mice), and they have been suggested to have diverged from a common ancestor, with the IFNβ gene being the primordial gene . Today, more than 50 years after their discovery, type I interferons have been included in our therapeutic armamentarium and are indicated for several disease entities [2, 8]. Firstly, type I interferons are widely used for the treatment of chronic viral infections, mainly by hepatitis B virus and hepatitis C virus . Several major breakthroughs in the field of interferon research have established the notion that type I interferons are not only antiviral peptides but pleiotropic cytokines. Along these lines it was observed that type I interferons can inhibit growth of some tumors by suppressing proliferation and inducing cell apoptosis, inhibiting angiogenesis, increasing immunogenicity of tumor cells and activating cytotoxicity against tumor cells . In this context, IFNα2 is used in some treatment regimens for malignancies including chronic B-cell (hairy) leukemia, chronic myelogenous leukemia, myeloma, lymphomas, melanoma, renal-cell and bladder carcinoma and Kaposi's sarcoma [2, 8]. Finally, recognition of modulatory effects of type I interferons has led to the discovery that they may success fully be applied in the treatment of multiple sclerosis (MS) . Type I interferons have also been used in the treatment of rheumatoid arthritis (RA) and inflammatory bowel disease (IBD), with more success in animal models than in the clinic [10–21]. In addition to the above-described beneficial effects in infections, in malignancies and in some autoimmune/inflammatory diseases, there is evidence that type I interferons can also be detrimental for the host by promoting autoimmunity, inflammation and interferon-treatment-related toxicities in a context-dependent manner [1, 2, 22–25]. The present review serves as an updated summary of the prevailing concepts about the biology of type I interferons and also provides insights for a better understanding of the interferon paradox: type I interferons in one context promote autoimmunity and inflammation, but in another context have homeostatic functions by restraining inflammation and tissue destruction [14, 26–28]. This paradox is exemplified by the opposing roles of type I interferons in systemic lupus erythematosus (SLE) (probably pathogenic)  and in MS (protective and therapeutic) . Type I interferons are produced during infection as part of an effective host defense against pathogens . Type I interferon production is triggered by pathogen-associated molecular patterns (mainly microbial nucleic acids and lipopolysaccharide) in the context of infections. In the setting of SLE, type I interferons are induced by immune complexes containing self-derived nucleic acids [3, 7, 22]. Serum levels of type I interferons have been observed in patients with active SLE, and this endogenous type I interferon is believed to contribute to pathogenesis . Interestingly, IFNβ is expressed in the inflamed synovium of patients with RA and at sites of central nervous system inflammation in experimental autoimmune encephalomyelitis (EAE) [30, 31]. This low level of local interferon is suspected to represent activation of a homeostatic mechanism to control the intensity of inflammation and to restrain the extent of tissue destruction [14, 32]. Inflammatory stimuli (including the cytokines TNFα and RANKL) produced in the microenvironment of the synovium and central nervous system may contribute to the local expression of type I interferons during RA and EAE [33, 34]. Indispensable for induction of expression of type I interferons is the balanced activation of several transcription factors, including interferon regulatory factors (IRFs), NF-κB and AP-1 . IRFs are considered key transcription factors for induction of type I interferons. They are activated by kinases in a cell-type-specific and stimulus-specific manner. IRF-3 is constitutively expressed and, following activation, potently activates the IFNβ gene. IRF-7 is highly expressed in plasmacytoid dendritic cells (DCs) and is induced by type I interferons; it efficiently activates both IFNα and IFNβ genes, and can serve as part of an amplification loop to augment type I interferon production . IRF-1 has been implicated in low-level induction of IFNβ by TNFα . Evidence indicates that certain IRF-5 mutations, by regulating interferon type I activity, confer susceptibility to SLE [36, 37]. Finally, c-Fos, the partner of c-Jun in the transcription factor AP-1, drives production of IFNβ downstream of RANKL signaling . In the setting of infection, recognition of pathogen-derived nucleic acids by specific sensors within the host's cells is a major stimulus for the production of type I interferons (Figure 1) [3, 7]. According to a recent report, binding of the nucleic acids to high-mobility group box (HMGB) proteins is required for their efficient recognition by the host's sensors . Two intracellular systems account for sensing nucleic acids that induce type I interferons: one is Toll-like receptor (TLR) dependent and is restricted to endosomes of specialized sentinel cells (monocytes, macrophages and DCs); the other is cytosolic and is ubiquitously expressed [3, 7]. Pathways (receptors and ligands) leading to type I interferon production. DAI, DNA-dependent activator of interferon regulatory factors; HMGB, high-mobility group box protein; LPS, lipopolysaccharide; MDA5, melanoma differentiation-associated protein 5; RIG-I, retinoic acid inducible gene I; TLR, Toll-like receptor. 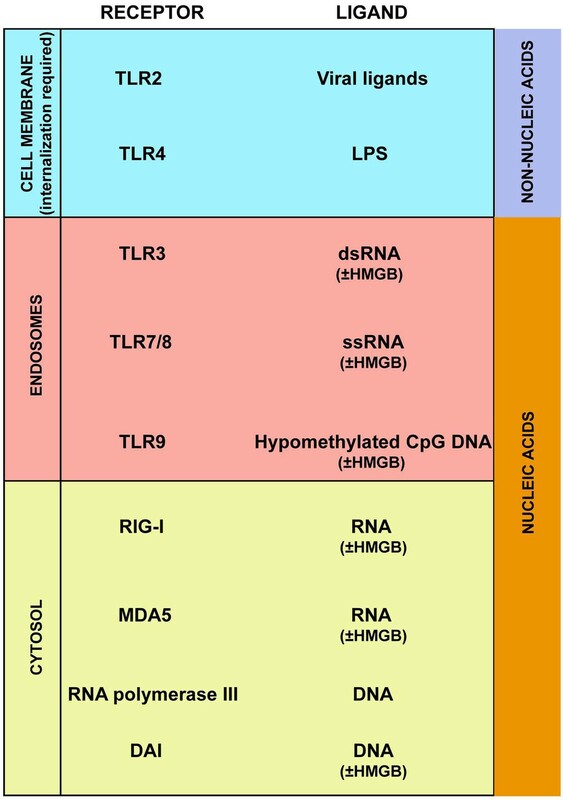 The TLR-dependent interferon-inducing system comprises TLR3, TLR7/8 and TLR9, which specifically sense dsRNA, ssRNA and DNA (hypomethylated CpG DNA), respectively. The cytosolic sensing system includes the retinoic acid inducible gene (RIG)-like receptors RIG-I and melanoma differentiation-associated protein 5 (MDA5), which are sensors of cytosolic RNA , the DNA-sensing receptor DAI (DNA-dependent activator of IRFs) , and RNA polymerase III, which transcribes cytosolic DNA into RNA that is sensed by RIG-like receptors [40, 41]. In general, the binding of the endosomal or cytosolic receptors with the high-mobility group box-nucleic acid complexes leads to recruitment of adaptor molecules (TRIF/TRAF3/NAP1 for TLR3, MyD88 for TRL7/8 and TLR9, and IPS1/TRAF3 for RIG-I and MDA5). In a cell-type-specific and stimulus-specific manner, kinases (TBK1, IRAK1, IKKα, IKKε and phosphoinositide 3-kinase (PI3K)) are then recruited that phosphorylate serine and threonine residues on the latent IRFs. Activated IRFs form homodimers or heterodimers, translocate to the nucleus and bind to regulatory elements in the promoter regions of type I interferon genes, triggering transcription . Although any nucleated cell has the capacity to produce type I interferons upon appropriate stimulation, prolonged endosomal retention of nucleic acids and high constitutive expression of TLR7, TLR9 and IRF-7 render plasmacytoid DCs the most powerful producers of type I interferons . Type I interferon production can also be induced by non-nucleic acid pathogen-derived molecular patterns (Figure 1). Recognition of lipopolysaccharide by TLR4 triggers the activation of IRF-3 by TBK1 kinase and results in production of IFNβ . This pathway is dependent on recruitment to the intracellular domain of TLR4 of the adaptor molecules TRAM, TRIF, TRAF3 and NAP1. It has recently been reported that TLR2 ligands of viral origin, but not those of bacterial origin, induce type I interferons in a MyD88/IRF-3/IRF-7-dependent manner . Trafficking of TLR2 and TLR4 from the plasma membrane to the endosomal compartment is required for induction of type I interferon [42, 43]. Interestingly, monocytes are a key source of TLR2-induced type I interferons in vitro and in vivo . Since monocytic cells outnumber plasmacytoid DCs in vivo, the latter may not be the major source of type I interferons in vivo. Indeed, monocytic cells have been identified as the major source of type I interferons in animal models of infection  and of lupus . In SLE, excess apoptosis and tissue damage combined with decreased clearance of apoptotic bodies probably result in an increased load of immunogenic self-nucleic acid-containing particles . Circulating autoantibodies, specific for nucleic acids or nucleoproteins, form immune complexes with the particles. These complexes are captured by receptors - for example, FcγRIIa - expressed on the surface of sentinel cells (monocytes, macrophages and DCs), gain access to the intracellular compartment, and are recognized by the endosomal and cytosolic system that trigger type I interferon production . The pleiotropic functions of type I interferons mirror a complexity of intracellular signaling pathways . The type I interferons all utilize a ubiquitously expressed heterodimeric IFNα/β receptor (IFNAR) and generate similar, although not necessarily identical, signals . IFNAR consists of IFNAR1 and IFNAR2 subunits that are associated with cytoplasmic protein tyrosine kinases Tyk2 and Jak1, respectively. IFNAR2 is also constitutively associated with STAT2. Ligation of IFNAR results in activation of Tyk2 and Jak1, and in phosphorylation of tyrosine residues in the IFNAR cytoplasmic domains, thus creating docking sites for signal transducers and activators of transcription (STATs), including STAT2 and proabably STAT1. Both STAT1 and STAT2 are activated at the IFNAR signaling complex by tyrosine phosphorylation, with subsequent formation of STAT1:STAT2 heterodimers and STAT1:STAT1 homodimers . These STAT proteins translocate to the nucleus, where STAT1:STAT1 homodimers bind to gamma-activated sequence (GAS) sites (consensus sequence TTCNNNGAA) in gene promoters and activate transcription. In contrast, STAT1:STAT2 heterodimers associate with IRF9 to form the ISGF3 complex that binds to an interferon-stimulated response element (ISRE) site (consensus sequence TTTCNN TTTC) [4, 46]. Type I interferons thus activate expression of genes that have either GAS or ISRE sites, or both, in their promoters [2, 46, 47]. ISGF3 and cognate interferon-stimulated response elements play a key role in activation of antiviral genes and antiviral responses, whereas gamma-activated sequence elements mediate induction of inflammatory genes such as chemokines. Type I interferons can also activate STAT3 and, in a cell-type-specific manner, STAT4, STAT5 and STAT6 . In addition to the classical Jak-STAT pathway, other signaling pathways - including the mitogen-activated protein kinase pathways and the PI3K pathways - are activated by type I interferons . These nonclassical signaling pathways are activated in a stimulus-specific and cell-type-specific manner downstream of IFNAR. There is evidence that the cytoplasmic protein tyrosine kinases Tyk2 and Jak1 are actively implicated in the induction of the nonclassical signaling pathways. For example, they phosphorylate the insulin receptor sub-strates 1 and 2, providing a docking site for the regulatory domain of PI3K (p85), and they activate upstream regulators of p38, triggering activation of the PI3K and p38 pathways, respectively. The biologic consequences of the activation of these nonclassical signaling pathways have been reviewed recently . Type I interferons are constitutively expressed at low levels; expression is rapidly enhanced upon viral or bacterial infection, aiming for an effective immune response against the pathogens [3, 35]. Type I interferons induce an antiviral state in cells by suppressing mechanisms for viral replication, trigger apoptosis in virally infected cells, promote natural killer cell-mediated and CD8+ T-cell-mediated cytotoxicity, promote the transition from innate to acquired immunity by augmenting DC maturation, cross-presentation of antigens and migration, and enhance T-helper type 1 responses, generation of T follicular helper cells, and humoral responses [3, 8, 48–51]. Mounting observations indicate that type I interferons are implicated in the pathogenesis of several diseases, with autoimmune characteristics including SLE, primary Sjögren's syndrome, dermatomyositis, scleroderma and insulin-dependent diabetes mellitus . The role of type I interferons in SLE pathogenesis is now a well-established notion that has been supported by several lines of evidence derived from humans and animal models. Serum levels of IFNα in SLE patients can be as high as levels achieved during acute viral infections, and a positive correlation between serum IFNα levels and disease severity has been described [29, 52]. Additionally, gene expression profiling with microarrays and real-time PCR demonstrated an IFNα signature in peripheral blood cells of SLE patients that was correlated with disease activity [53, 54]. Interestingly, IFNα therapy in the setting of cancer or chronic viral infection induces autoantibody formation in 4 to 19% of patients and occasionally induces SLE-like symptoms [22, 25]. Finally, IFNα administration in lupus-prone mice accelerates disease, and deletion of IFNAR substantially decreases morbidity and prolongs survival in these animals [24, 55]. SLE is characterized by autoimmunity and organ inflammation. Type I interferons may contribute to disease pathogenesis by promoting either autoimmunity or inflammation, or both (Figure 2, left-hand side) [22, 23, 46]. Context-dependent effects of type I interferons. In the context of systemic lupus erythematosus (SLE) (left-hand side), type I interferons are probably pathogenic by the following mechanisms: (1) augmenting humoral responses and production of complement-fixing pathogenic antibodies (induce generation of T follicular helper cells (Tfh), stimulate formation of germinal centers and enhance survival of B cells and differentiation to plasmablasts and antibody-producing plasma cells); (2) activating immature dendritic cells (DCs), braking peripheral tolerance to self-antigens; (3) promoting T-helper type 1 (Th1) differentiation; (4) promoting natural killer (NK) cell-mediated and CD8-mediated cytotoxicity; (5) inducing production of chemokines that recruit inflammatory cells at sites of immune complex deposition; and (6) priming myeloid cells for enhanced responses to inflammatory stimuli. In the context of multiple sclerosis (MS), rheumatoid arthritis (RA) and inflammatory bowel disease (IBD) (right-hand side), type I interferons are potentially anti-inflammatory and tissue protective by: (1) inhibiting generation of Th17 cells; (2) increasing anti-inflammatory mediators and decreasing proinflammatory mediators; (3) suppressing angiogenesis; (4) reducing tissue invasion of inflammatory cells; (5) shifting the balance of proteases versus protease inhibitors in favor of inhibitors; and (6) suppressing osteoclastogenesis. Ab, antibody; STAT = signal transducer and activator of transcription. One mechanism by which type I interferons may promote autoimmunity, driving SLE pathogenesis, consists of abrogating peripheral tolerance to autoantigens through activation of immature DCs . Normally, autoreactive lymphocytes that have escaped from the central checkpoint of the thymus are controlled in the periphery by immature DCs lacking co-stimulatory molecules. DCs capture, process and present antigens in association with MHC molecules to lymphocytes. Antigen presentation by immature DCs leads to tolerance. Type I interferons promote maturation of DCs through induction of MHC II molecules, as well as CD40, CD80 and CD86 co-stimulatory molecules. Sera from patients with active SLE promote in vitro maturation of DCs, and blood monocytes derived from these patients exhibit DC-like properties such as enhanced antigen presentation and co-stimulatory capacity . During the course of SLE, tissue damage and decreased clearance of apoptotic bodies generate an excess of autoantigens. Augmented levels of type I interferons may promote a break of tolerance to these autoantigens, thus driving autoimmunity (by allowing activation of autoreactive lymphocytes by interferon-activated DCs) . A hallmark of SLE is the presence of autoantibodies, including antinuclear antibodies, antibodies directed to cell surface molecules (on erythrocytes, platelets, neurons), antibodies against proteins bound to phospholipids and antibodies against antigens expressed in target organs like the kidney . Type I interferons, via complex mechanisms, enhance antibody responses (adjuvant activity) and promote long-term antibody production, class switching and immunological memory [48–51]. Recently it has been reported that type I interferons stimulate generation of germinal centers by targeting DCs and stromal cells to promote development of T follicular helper cells . The T follicular helper cells represent a distinct T-helper cell population restricted to draining lymph nodes and specialized in supporting differentiation of germinal center B cells, a mandatory process for production of class-switched IgG . Additionally, type I interferons stimulate production of B-cell activating factor belonging to the TNF family (BAFF), of a proliferation-inducing ligand (APRIL), and of IL-6 - all of which promote B-cell survival and differentiation to plasmablasts and antibody-producing plasma cells [22, 50]. Several investigators, including our group, have considered the possibility that type I interferons may contribute to SLE pathogenesis by bolstering inflammatory responses through priming of myeloid cells (DCs and macrophages) and by inducing high-level STAT1 expression . The concept of priming is a key aspect of interferon biology and is defined as pre-exposure to low concentrations of interferons leading to enhanced responses to minor subsequent stimuli (including infections, autoantigens, environmental antigens, components of damaged tissues, or cytokines) . The classical function of priming is to potentiate innate immune responses during the early phase of infections when cytokine concentrations are low, thereby enhancing host defense. A common theme is that priming results in increased activation of STAT1, with its attendant inflammatory actions. STAT1 further amplifies cell activation by activating STAT1-mediated feedforward mechanisms (described below) and by counteracting feedback pathways such as those mediated by suppressor of cytokine signaling (SOCS) proteins or STAT3 . A substantial body of data supports the notion that priming of immunocytes occurs in SLE and other rheumatic diseases and contributes to disease pathogenesis. As previously noted, type I interferons are expressed in SLE at levels that would be expected to elicit priming . Furthermore, leukocytes isolated from SLE patients have been found to express increased levels of STAT1, a key marker in interferon priming. Interestingly, with the use of corticosteroids, suppression of STAT1 expression occurs concomitantly with demonstrated clinical improvement in SLE patients, thereby providing a possible mechanism of action for this drug class in systemic lupus . Isolated monocytes of SLE patients who had not undergone treatment displayed an enhanced response to TLR activators (such as lipopolysaccharide) and IL-1β, potentially as a result of in vivo interferon-mediated priming . By priming the host response, type I interferons can, in turn, enhance and modulate the inflammatory cellular responses to other molecules long implicated in modulating the pathogenesis of autoimmune diseases, such as TNF, IL-1 and IL-6, IFNγ, and TLRs [23, 35, 46, 47]. Several mechanisms have been proposed to explain how exposure to interferons sensitizes cells to subsequent stimuli. Stimulation with type I interferons potentiates the physical association between IFNAR1 and IFNGR2 or gp130 . Formation of such receptor complexes (receptosomes) increases the docking sites for STATs, resulting in more efficient dimerization of these STATs and enhanced responses to IFNγ and IL-6. Another mechanism of priming with relevance to SLE is that type I interferons induce increased expression of TLR3, TLR7 and TLR9, thus sensitizing cells to nucleic acid stimulation. As previously noted, a key feature of interferon priming is the increased expression of STAT1 . Increased intracellular availability of STAT1 results in increased STAT1 phosphorylation downstream of IFNGR and IL-6 receptors, resulting in enhanced cellular activation in response to IFNγ and IL-6 stimulation [46, 47, 57]. An additional aspect of the biological consequences of the high intracellular levels of STAT1 is the perturbation of IL-10 signaling and function. IL-10, a powerful anti-inflammatory cytokine, is a potent activator of the anti-inflammatory STAT3 and a weak activator of STAT1 in myeloid cells, and does not normally induce STAT1 target genes as does IFNγ. Pre-exposure to type I interferons, however, reprograms STAT activation by IL-10 such that STAT1 is more strongly activated by IL-10 in these cells, resulting in induction of a group of STAT1-dependent genes and thereby a gain of inflammatory function . Additional mechanisms by which type I interferons may promote inflammation and tissue damage in the context of SLE include the induction of pathogenic complement-fixing antibodies and production of chemokines that recruit inflammatory cells at sites of immune complex deposition . It is also interesting to consider the possibility that type I interferons may have pathogenic effects by acting on cells in target organs. Recent evidence from our and other laboratories has demonstrated an interferon signature in the kidneys in murine lupus nephritis that is associated with macrophage infiltration and proliferative nephritis [58, 59]. Our study provides in vivo evidence that IFNα increases matrix metalloproteinase activation and growth factor expression to promote glomerular cell proliferation and early fibrosis. This process was mediated by alternatively activated macrophages expressing a dysregulated tissue repair program . Although an interferon signature has been observed in peripheral blood cells derived from a subgroup of patients with MS and active RA [60–62], there is evidence suggesting that type I interferons are therapeutic in MS and are potentially beneficial for RA and IBD by reining inflammation and tissue destruction. Firstly, IFNβ has been shown to reduce attack frequency in patients with MS and has become the established treatment of choice for the relapsing remitting form of MS . Additionally, in animal models of inflammatory arthritis, MS (EAE) and IBD, administration or triggered production of IFNα/β or IFNβ gene therapy has been shown to reduce disease severity [10, 11, 13, 15, 16, 20, 63, 64], while the lack of type I interferon signaling (IFNAR1 knockout or IFNβ knockout) resulted in more severe disease manifestation [15, 16, 20, 31, 65, 66]. Various mechanisms have been proposed to explain such anti-inflammatory and tissue-protective effects of type I interferons (Figure 2, right-hand side) [14, 26–28]. Reports suggest that type I interferons regulate the inflammatory milieu by increasing expression of anti-inflammatory factors (including IL-10, IL-27, transforming growth factor beta, IL-1R antagonist, soluble TNF receptors, suppressor of cytokine signaling) and decreasing proinflammatory mediators (including IL-1, IL-6, IL-8, IL-12, IL-18, TNFα, IFNγ, osteopontin, prostaglandin E and cyclooxygenase-2) [8, 14, 26, 28, 67]. It is important to emphasize that type I interferons modulate the inflammatory microenvironment in a context-dependent manner and not uniformly. Thus, administration of IFN-β in mice with collagen-induced arthritis resulted in significant decrease in synovial expression of TNF-α and IL-6 , while in rats with adjuvant-induced arthritis expression of IL-1β but not TNF-α and IL-6 was reduced . Type I interferons suppress production of proinflammatory cytokines both at the level of transcription and at the level of mRNA stability. One mechanism may be the capacity of type I interferons to suppress key transcription factors for induction of proinflammatory cytokines (including NF-κB, AP-1 and PU.1) [13, 23]. In a study from our laboratory, IFNα also suppressed TNFα production by inducing expression of the tyrosine kinase Axl that in turn induced expression of Twist, a transcriptional repressor of the TNFα promoter . Interferon- induced Axl and related TAM kinases have been implicated in feedback suppression of TLR responses by a SOCS1-mediated mechanism . Additionally, type I interferons induce the expression of an RNA-binding protein named tristetraprolin, which destabilizes transcripts of proinflammatory cytokines (including TNFα and IL-6) by mediating mRNA decay . Evidence also indicates that type I interferons not only suppress production but also inhibit the function of proinflammatory mediators. Our group observed, using an in vitro system, that IFNα attenuates IL-1β proinflammatory effects by downregulating the expression of the signaling receptor IL-1RI , and others have found that type I interferons induce production of IL-1R antagonist by a PI3K-mediated mechanism . Interestingly, accumulating evidence indicates that type I interferons suppress T-helper type 17 (Th 17) cell development [66, 67, 73–75]. In animal models of arthritis (collagen-induced arthritis) and central nervous system inflammation (EAE), Th 17 cells are principal drivers for disease pathogenesis. Their pathogenic role has also been suspected in human diseases including RA, MS, IBD, psoriasis, juvenile diabetes and autoimmune uveitis. It has been suggested that type I interferons suppress Th 17 cell generation by modulating the cytokine microenvironment that determines the fate of T-helper cells. Type I interferons - by targeting antigen-presenting cells (monocytes, macrophages and DCs) - increase the production of IL-27, which is a potent inhibitor of Th 17, and decrease IL-1β, trans forming growth factor beta 1 and IL-23, which favor Th 17 differentiation [66, 67, 74, 75]. A recent report indicates that type I interferons induce the production of IL-27 in DCs by downregulating the intracellular isoform of osteopontin (Opn-i) . The anti-angiogenic effect of type I interferons may represent another mechanism contributing to the beneficial function of type I interferons in the context of inflammatory arthritis, where increased vascularization is a prominent component of synovial pathology . Type I interferons inhibit angiogenesis either indirectly by targeting nonendothelial cells or directly by targeting endothelial cells. In nonendothelial cells, type I interferons decrease the production of angiogenesis-promoting factors (including basic fibroblast growth factor and vascular endothelial growth factor) and induce angiostatic chemokines ; in endothelial cells, type I interferons trigger an antiangiogenic program of gene expression  and suppress proliferation of endothelial cells and their progenitors . Another important facet of the homeostatic function of type I interferons is their capacity to protect tissue integrity and restrain damage. IFNβ preserves the integrity of the blood-brain barrier and attenuates demyelination in EAE [31, 32], and prevents destruction of cartilage and bone in animal models of arthritis . Proposed explanations for this tissue protection have been that type I interferons regulate inflammatory cell trafficking, modulate the balance between proteases and protease inhibitors and inhibit osteoclastogenesis [14, 26, 28]. Type I interferons restrict tissue invasion of inflammatory cells by regulating the expression of adhesion molecules (downregulate expression on the cell surface and upregulate soluble forms of adhesion molecules) and by reducing MMP-9, which degrades extracellular matrix and facilitates tissue entrance of inflammatory cells . Finally, type I interferons are powerful inhibitors of osteoclastogenesis by decreasing expression of c-Fos, an essential transcription factor required for osteoclastogenesis induced downstream of RANKL . Additional mechanisms that contribute to the anti-osteoclastogenic effects of type I interferon may include an inhibitory effect on the expression of osteoclastogenic TNFα and IL-1β and decreased c-Cbl and Cbl-b expression . It is clear that type I interferons can either promote or suppress immune and inflammatory responses and autoimmune diseases, depending on the context (Figure 2). Several explanations for the pleiotropic and paradoxical nature of interferon activity in different immune responses and autoimmune diseases have been proposed. These include different biological activities based on timing, different concentration-dependent effects, the location of expression and effects on cells that make up target organs, and differential effects on immunity versus inflammation or on innate immunity versus acquired immunity [46, 47]. In addition, type I interferon activity and signaling are regulated and reprogrammed during immune and inflammatory responses, with alterations in the balance between activation of STAT1 and STAT3 or STAT4 [78, 79]. An alternative nonmutually exclusive explanation proposes an interferon-TNF axis in which each cytokine is pathogenic in different diseases and in which interferons and TNF cross-inhibit each other's expression . Emerging evidence supports a complex crossregulation between interferons and TNF, including induction of interferons by TNF in certain cell types  and extensive crosstalk at the level of signal transduction. 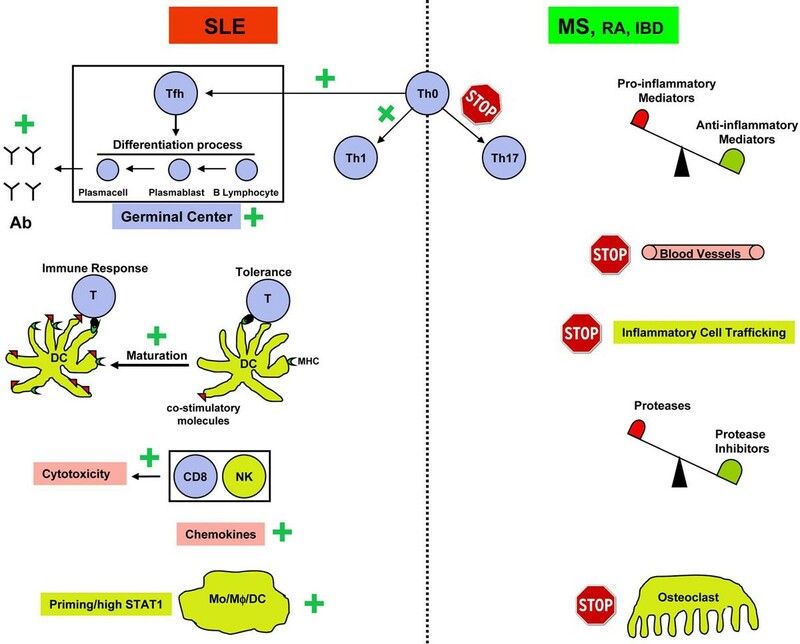 Blockade of type I interferon pathways has emerged as an attractive therapeutic approach for SLE [22, 24], while activation of the same pathways has proven clinically effective in a subset of patients with MS  and in animal models of RA and IBD [14, 20]. This distinction reflects an interferon paradox and raises the question of how we can target interferon pathways (block or trigger) in such a way that detrimental effects are minimized while beneficial effects, including a key role in antiviral host defense, are preserved. Therapeutic approaches that target specific interferon-induced signaling pathways may be beneficial. For example, selective inhibition of proinflammatory STAT1 activation while preserving ISGF3 activation and antiviral responses may represent a fruitful approach . A better understanding and characterization of the molecular mechanisms that regulate type I interferon signaling and downstream target genes (for example, by applying bioinformatics) will set the stage for selective manipulation of interferon pathways without the risk of compromising homeostatic functions or host defense. The present work was supported by grants from the National Institutes of Health (LBI) and the Niarchos Foundation (GDK). This article is part of Arthritis Research & Therapy Volume 12 Supplement 1: The role of IFN alpha in autoimmune disease. The full contents of the supplement are available online at http://arthritis-research.com/supplements/12/S1. Publication of the supplement has been supported with funding from MedImmune, LLC.